Wright Manufacturing released its compact Stander Intensity, Stander I. 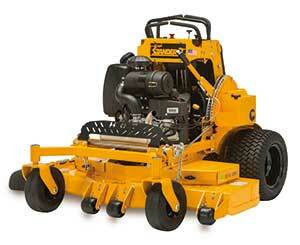 The stand-on mower is equipped with the first 36-inch deck to incorporate Wright’s revolutionary Aero Core technology. The floating deck on the Stander I tilts side-to-side and front-to-back, allowing the mower deck to better follow the terrain contours, the company said. The Stander I’s floating stand-on platform absorbs rough terrain through elastopolymer bumpers. The mower also features recessed caster wheels to reduce the turning radius. Users can choose between a 48-inch or 52-inch deck. Engines range from 18.5 to 22.1 hp.